As the temperature begins to drop, experts will emphasize that your summer tires, or even all season tires will not be as efficient when driving in the cold and snowy icy conditions. 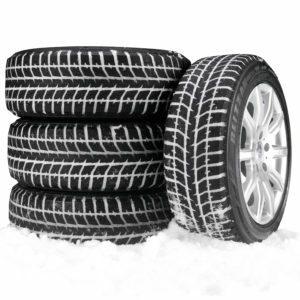 All season tires are not made of soft rubber in the same manner as snow tires. They are harder to ensure they last through hot summers. The snow tire is made of soft rubber. They will provide better handling and better traction in snow and ice conditions. Snow tires also have better rubber grips for digging their way through deep snow. If you regularly drive in snow, don’t take a chance install snow tires on your car. Driving in heavy snow with all season tires can actually be quite dangerous. Install snow tires before the first snow fall. Winter tires should be marked with a picture of a peaked mountain and a snowflake to indicate that they meet the standards for snow traction performance and have been engineered specifically for use in snow conditions. If this symbol is not present then they are not winter tires and you should not buy them. these tires will not deliver the performance of true winter tires. Always install a set of snow tires in a set of four. This will provide better control and traction in snow conditions and icy conditions. Maintain the same tread pattern and internal construction and size. Acceleration, stopping and vibration as well as overall control will be improved with four tires that are the same. New tires are designed to spin in one direction only. Make sure that your tires are mounted on the correct side to provide maximum gripping action. Incorrectly mounted tires will actually provide instability and sliding out of control situations in icy and snowy conditions. Installing tires at the rear that are also snow tires for front-wheel-drive cars will provide more stability. They will not spin out in the middle-of-the-road. This is a truly scary event for most people especially when there is oncoming traffic. Some dealers will fill your tires with nitrogen which is much more stable as temperatures change. Regardless, check your tires pressure on a regular basis to ensure that there is sufficient air pressure in the tires at all times to maintain proper gripping action in snow and ice conditions. Although nitrogen is more stable, extreme temperatures can cause tire pressures to change. Monitor your tires pressure on a regular basis. If you have an air pressure monitoring system in your car, the alert light on your dashboard will glow when your tires are low in pressure. always make sure your tires are properly inflated.